Asian markets rose yesterday, spurred by overnight 2.6% surge on Dow Jones and optimism that Europe Finance ministers meetings set for later in the global trading day will bring some details of possible solutions to Europe’s debt crisis. Tracking the regional gains, FBM KLCI jumped 13.2 points to 1444.7, substantially below its intraday high of 26.5 points as news of S&P could cut France’s AAA rating outlook within days and Moody’s possible downgrade the subordinated debt of 87 banks across 15 countries dampened sentiment. We still advocate investors to capitalize on any rebounds to trim their positions or maintain a short-term trading oriented approach, given the external headwinds and volatility is likely to remain extraordinarily high. 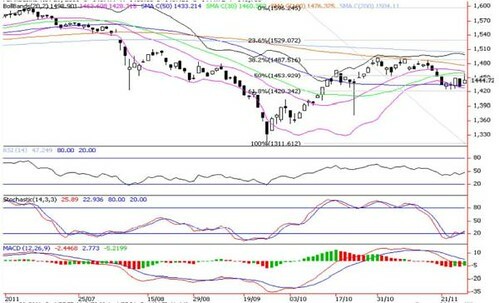 We doubt this downtrend could reverse any time soon as KLCI struggles to crack above the immediate resistance zones at mid Bollinger band (now at 1464) and 100-d SMA (1476) levels. If the last week’s low 1424 (November 23) is taken out, we expect the next down leg towards the 1400 psychological level and probably retesting the 76.4% FR support at 1378 points.